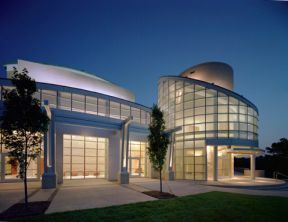 The North Carolina School of the Arts in Winston-Salem was established in 1963 by the North Carolina General Assembly as the nation's first state-supported residential school of the arts. A constituent institution in the University of North Carolina System, the school trains students for professional careers in the fields of dance, drama, filmmaking, music, the visual arts, and production and design. Study at the School of the Arts qualifies students to receive high school, college arts, bachelor's, and master's degree diplomas. All programs of instruction emphasize first-hand experience and performance; the audition/interview is therefore the most important portion of the application for admission. Collectively, members of the school's community offer more than 350 performances to the public each year. In accordance with state legislative requirements, at least 50 percent of the students enrolled at the School of the Arts must be North Carolina residents; the remaining one-half come from 40 other states as well as more than a dozen other nations. In the early 2000s the school enrolled about 1,100 students-more than 700 of them college undergraduates-on its 67-acre campus in Winston-Salem. Tuition that year was free for in-state high school students and $1,900 for out-of-state students. Undergraduates paid $733 and $4,265, respectively, and graduates, $768 and $4,367. Scholarships are available to all students based on financial need, talent, or both. The North Carolina School of the Arts has produced a significant number of prominent alumni, including Tony Award nominee Terrence Mann; Metropolitan Opera bass-baritone John Cheek; Mary Cochran of the Paul Taylor Dance Company; and film/theater art director Tony Fanning. Leslie Banner, A Passionate Preference: The Story of the North Carolina School of the Arts (1987). North Carolina School of the Arts, Bulletin (1994). UNC School of the Arts. Image courtesy of UNC School System. Available from http://www.northcarolina.edu/campus_profiles/INST_UNCSA.php (accessed November 8, 2012). Dancers at the UNCSA. Image courtesy of UNC School System. Available from http://www.northcarolina.edu/campus_profiles/INST_UNCSA.php (accessed November 8, 2012). Name changed in University of North Carolina School of the Arts in 2008. 1 January 2006 | Whittenburg, Catherine A. Do you have any activities that would allow home schooling or online program participants (Grade 8) to participate in that would provide opportunities for personalization with others? Thanks for visiting NCpedia and taking time to ask this question. NCpedia does not have an online educational program, however our resources would be very useful for 8th graders doing research. NCpedia also has an educator resources area where you will find a range of resources, including ties to NC curriculum standards and educator resources including lesson plans and activities. This section is also currently being added to so please check back frequently for additional resources. You may want to search the internet if you're looking for specific online training options for 8th graders.